Relaxing with “Thé Petales”: Rose Petal Tea from Perfumer Miller Harris, London. “My name is Peggy Markel and I haven’t written a blog in over 15 days”. This is what I imagine a meeting at Bloggers Anonymous would sound like. In this case, I confess that I can’t keep up with blogging, or other social media word flow. My life moves fast in the “slow food and travel” lane. Just this late summer and fall, I have kept moving at the speed of light. I’ve been steeped in poetry, fed warm sheepsmilk ricotta, tasted numerous full-bodied wines, eaten rustic ragus, seafood stews and delicate volutes topped with fennel pollen and drizzles of aromatic oils on various stuffed pastas, meats and frilly fresh salads. I’ve sucked on salt chocolate, cinnamon chocolate, hot Sicilian chocolate and soon to be, ambergris chocolate. I’ve traveled by air, train, ferries, sailboat and zodiac. At times, I switched to donkeys, camels, mopeds and bicycles. Even when I have stopped for a few short days here and there, I am constantly asked to do something, organize something (even a closet), make plans, write out a recipe, think of a plan for next year (but right now), price something, talk to this person, introduce that person, meet these people, re-pack a bag, hop a taxi, book a ticket, or deal with the details of the moment. Old and new friends are constantly coming and going. This sort of existence has texture and depth, rich in meaningful, earthy experiences. A constant massage, it touches the places that love attention, offering a sensual smorgosbord for the eyes, ears, nose and palate, engaging me deeply in body, speech and mind. So much so, that at times I feel like my life is like a flimsy lacy petticoat, hanging half way off the shoulder and my legs are dangling out the window of a brothel. Enough already. I have a thousand stories to tell and many details of discoveries to share. Most of them seem like they wait like wallflowers to be noticed or disappear all together. Today, with another bag to pack and upcoming transition to make, I sat down to write instead. I made a cup of assam tea with a precious pinch of thé petales (rose petal tea) from Miller Harris. It was a gift from the perfumer herself. I met Lyn Harris at Jnane Tamsna in Marrakech. We share a passion, not only for tea, but for this private guesthouse that we frequent every year. It feels like a home away from home. I know everyone, including the carob trees and rose bushes, surely she knows every aromatic plant. The interesting thing, is that I was aware of her perfume before I met her. I have her “fig” and “fluer oriental.” Unusual fragrances, they stand apart from the plethora of powdery perfumes. Meeting her on casual turf in caftans and bare feet brought a certain air of authenticity to her product and mutual like-mindedness of mood. “Drinking rare and beautiful teas has always been an essential luxury,” says Lyn Harris. “Inspired by the delicate art of balancing flavor and aroma, Lyn has combined the world’s finest teas with pure, natural extracts to create a collection of blends with top, heart and base notes. This tea demands the prettiest of cups. Smooth and sensual Turkish rose combines with velvet notes of vanilla Ceylon. A heart of Taiwanese White Tip Oolong is entwined with geranium bourbon from the island of Reunion to create a delicate refreshing cup. ” So says the back of the tea canister. So that description my friends…”is my cup of tea,” on this fine Sunday afternoon in Florence. Life no longer hanging out the window, but sitting quite properly enjoying one’s tea in a pretty cup reading a novel, Everything Beautiful Began After by Simon Van Booy. 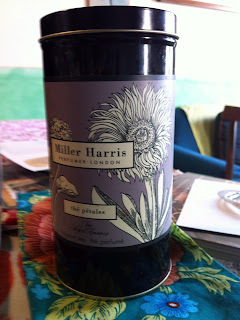 Visit the Miller Harris tea collection. Learn more about peggy markel’s upcoming culinary food tours and slow food adventures. click here.